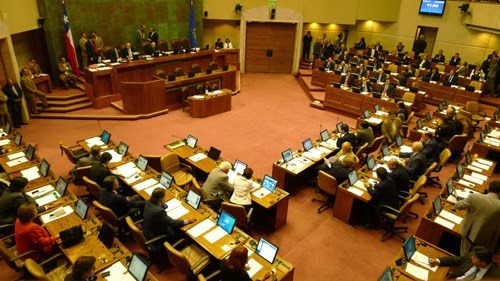 The Chamber of Deputies of Chile passed today a resolution to express "solidarity with the Armenian nation condemning the genocide of its people that started in 1915". The resolution No. 324, which received 77 votes in favor, 1 against and 3 abstentions, also asks the Government of Chile to adhere to what has already been agreed by the UN in 1985. The initiative was presented by Gustavo Hasbun, Joaquin Tuma, Issa Kort, Aldo Cornejo, Marco Antonio Nuñez, Joaquin Godoy and Jorge Tarud. Lawmakers said that "April 24 of 1915 marked the beginning of a systematic policy of extermination of Armenians by the Ottoman authorities after detention without trial, disappearance and death of hundreds of intellectuals, writers, composers, artists, community leaders and the entire leadership of the Armenian community in Constantinople, including two Armenian deputies of the Turkish Parliament whose parliamentary immunity was not respected". They added that this genocide, conducted between 1915 and 1923, meant the death of over 1,500,000 Armenians. "This despicable action was the first ethnic cleansing of the twentieth century." It also records that the Armenians and their various organizations around the world have persevered in gaining recognition from the international community on this genocide. "Such recognition was granted in 1985 by the Sub-Commission on Prevention of Discrimination and Protection of Minorities of the United Nations, which described the case as an Armenian genocide". The Senate of Chile, by agreement No. 531 of June 5, 2007, has already condemned the genocide, although the Chilean Government did not yet. "It is an ethical duty that Chile endorse the decision by the UN in 1985."